At some time before September 1575, Margaret Grazebrooke of Middleton married Henry Sewell of Coventry. Margaret and Henry were Ann Sewell Longfellow's great grandparents. Happily for us they both came from well to do families who held/owned land and paid taxes and best of all, left wills. Because births were not always recorded, or if they were the records are now lost, often times all we know about these people are the dates they wrote their wills or were buried. We are also lucky that several descendant of Margaret and Henry Sewell were famous, not only in their time but still well known by scholars in our own. The poet Henry Wadsworth Longfellow was a descendant of Ann Sewell Longfellow and Jurist Samuel Sewell was her brother. The Grazebrook family has been traced far back into 12th century medieval England. This research was done in the early 20th century by Dr. Joseph Jackson Howard, who included it in a book called Miscellanea Genealogica et Heraldica, Vol 3. It was published in London in 1900. To my knowledge this research has not been duplicated, so we put our trust in you Dr. Howard. (This book is available for free from Google play books). Dr. Howard got his information about the family from Calendar Rolls, Administrative and Fine Rolls and charters. These documents would have been written in Latin, so Dr. Howard must have been quite a scholar. Since this family is so well researched, I can't possibly add any more to the story from a genealogical viewpoint. But, maybe I can flesh out the story a tiny bit with some history. So, here is what I think I know about the Grazebrooke family. Margaret Grazebrooke's ancestors lived in the Shenston area of Staffordshire since around the year 1200. About 1204 Bartholomew de Gresebrok of Yorkshire was granted a manor house in Shenston from Sir Robert de Grendon. Sir Robert's mother was Avicia, daughter and heir of William de Bray. The house and land were part of her marriage settlement known as a dower. Sir Robert inherited the rights to the manor from her. The de Bray family had held this manor since 1127. The de Brays did not own the manor but held it from the Earl of Warwick, who held it from the King, under the feudal system in practice in England at that time. Under this system, all the land in England belonged to the King. The Earl of Warwick, the de Brays and the de Grendons were all Norman French descendants of men who had come with William the Conqueror in 1066. It was King William who established the feudal system. Were the de Gresebroks also Norman French, I'm guessing they were. The de Brays had built a new manor house about 1190. Bartholomew renamed this manor Gresbrok Hall. The de Gendon family lived at Shenston manor. These two family names appear quite often together in the records. Bartholomew died by 1268 leaving a wife Edith and two sons, Adam and Robert. The fact that this land was not owned but held would be the cause of many a lengthy lawsuit in the years to come. One thing that does strike me about Bartholomew, from a genealogical standpoint, is that he was granted the land in the year 1204 and he held it until his death around 1268. Life expectancy in medieval England for those who survived childhood was only about 60 years. If Bartholomew was given the land at age 20 and held it for over 60 years, then he was a seriously old man when he died. I am guessing that there might be a generation, or two, left out of this pedigree. When Bartholomew got his land from Robert de Grendon in 1204, King John I was in the fifth year of his reign. King John was forced to sign the Magna Carta in 1215, he died in 1216. The country was in the midst of 'The First Barons' War'. Many of King John's leading men waged war against him. They even invited Louis, the Dauphin of France, to cover over and be their King. After the death of King John in 1217, the rebellious barons switched their alliegence from Louis, who was in London, to John's son and heir Henry III. In 1268 Adam was sued by Alicia the widow of Philip de Legh, she was the daughter of Robert de Grendon. In 1273, Robert de Grendon was dead and his widow Scolatica was suing everyone who had land from Robert. She was trying to gain control of her dower which was one third of her husbands property. She sued Adam for one third of four acres of land in a place called Stonhale. If you look at at map of Shenston there is a village called Stonnall right nearby, this might be the location of that land. It is possible that Alicia was also trying to get her dower lands established as she was identified as a widow at the time. did you just assart my land? Early in the reign of King Henry III, b. 1207, his advisers came up with a plan to raise more money for the Crown. They would send out men to find newly cleared land known as assarts. This was land that had previously been forested or considered waste land and was not generating any income. Once land was producing crops the Crown wanted to be able to raise taxes from it. You had to apply to the Crown for permission to assart land. If it was found that you assarted land without prior permission, the land would be "taken into the King's hand". If you wanted the land back, you paid a fee. On the day after the Feast of St. Michael in the 55th year of the reign of King Henry III, the year 1271, Adam son of Bartholomew of Schenestan appeared before Roger de Clifford and the other justices who were hearing the Pleas of the Forest. He was fined 18d. for an assart of one acre that he held in fee from Robert de Grendon. The plea rolls are full of men who were presented for unauthorized assarts as well as men who had killed deer in the royal forests. These 'malefactors of venison' included William de Beauchamp, the Earl of Warwick and his brother. No one, it seems, was to high or mighty to be charged with taking the King's deer without his permission. Boy, we're learning all kinda new things today. In 1274 Adam paid a fine to hold an Assize. An Assize was a judicial inquest. If you wanted to take someone to court you had to pay a 'fine' to request it. This fine might be called court fees today. In September of the next year Adam and his mother Edith pay another fine, this time for something called a 'writ de pone'. This writ was a request to move the legal action from the county court to the royal court. In 1276 Adam brought a writ called mort d' ancestor against Ralph de Grendon. This type of writ was a pleading in a royal court, concerning claims by an heir that another had usurped his rightful succession to a free tenement at the death of the parent.This writ was presented on the 29th of January but Adam failed to appear to present his case against Ralph. In 1280 Henry de Bray sued Adam for land in Holm. I cannot find anywhere named Holm near Shenston. Maybe it was a village which no longer exists? Anyway, once again this suit involved dower lands, and Adam again failed to appear. The sherriff was ordered to take land from Adam, to the value of the dower land, and put it 'into the King's hand', and summon Adam back to court. Adam was called back to court in the year 1294. This was a continuance of the case brought by Alicia de Legh back in 1268 to recover some of her land. Adam was represented in court by his brother Robert. Adam was not there because he had died. Robert was the son of Bartholomew and Edith and brother of Adam. Adam died without children so Robert was his heir. He inherited the right to the land held by Adam and also the lawsuits against Adam for that land. He would eventually lose the suit brought by Alice de Legh. Like his brother Adam he was fined for a new assart of 2 acres in Stonhal. 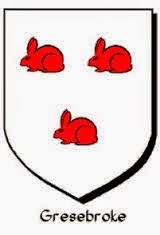 The land was in fee to Robert de Grendon, but was being farmed by Robert of Stonhal. He was growing rye and oats. The fine was 4s. In 1297 Robert was involved in a court case which highlights the feudal system in which he, and everyone else in England, lived. He appeared in court and claimed that one Theobald de Neville had unjustly taken his cattle, six oxen and two cows, from Robertscroft and driven them to the manor of Theobald in Shenstone. He was suing Theobald for 40s. in damages. Theobald counter that Robert's land, which had been given to his father Bartholomew by Robert de Grendon was in the possession of Ralph de Grendon who had died. One third of Ralph's land was the dower of Isabella, widow of Ralph. She, in turn, had demised it to him, Theobald, for the term of her life. Are you following me here? It's a bit tricky. Theobald told the court that Adam had held his land from Ralph by homage and fealty and by a service of 5s. annually and by a heriot. This was transferred to Isabella with her dower and then to him, Theobald when she demised the land to him. A heriot was a death duty owned to the lord of the manor. Theobald was claiming a heriot for the death of Adam which was supposed to be a horse with bridle and saddle as well as an 'aketon' and a 'lorica'. A lorica was a breastplate, so we must be talking about armor. Robert said that Adam had never given his service to Theobald and that he had died some six years before Theobald was given the land by Isabella. The case was referred to a jury. I can't find any resolution for the trial. You know what all this reminds me of is the Paston family of Norfolk. Have you read this book about them? 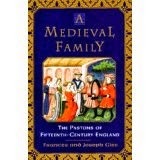 It gives a great overview of medieval life in England. The Pastons, not unlike the de Gresebroks, are constantly battling their neighbors, tennents and over lords over land disputes. If you haven't read it, I highly recommend it. Robert II died sometime prior to 1305 and was succeeded in the estate by his son, Robert III. This Robert first hit the court records in 1305. He and another fellow were charged with having William of Stonhal charged with a felony on three occasions, and each time had acquitted him for a bribe. They were call common conspirators. Robert witnesses charters and was sued on several occasions. His son Robert IV inherited his estates. In 1305 the reign of King Edward I was coming to a close. His reign saw much reform of the common law. Edward also waged a ferocious war against Scotland, calling himself "the Hammer of the Scots". There was also a second 'Barons' War' in which Edward fought on both sides, first against his father and then against the Barons who were led by Simon d' Monfort. I wonder if the Grazebrookes participated in any of the battles? This Robert was summoned to appear on a jury in 1325. The case involved the murder of Sir Thomas Murdak. I was surprised, when I read some of the court records related to this case, by how sophisticated the judicial system was in the 1300's. I don't know why I was surprised but chalk it up to ignorance I guess. The murder of Thomas sounds like something out of an Agatha Christie novel. Robert Ruggele, who turned King's evidence, described how he and his cohorts had been sent to kill Sir Thomas by Sir John de Vaus. He also claimed that Sir Thomas' wife Juliana was in on the murder. Robert told the jury that on the night of 11 April 1316, Sir Thomas was in bed at his castle of Stouton. William, son of Richard Bodekisham, struck Thomas in the head with a staff. As Sir Thomas tried to rise from the bed he was struck by his chaplain and steward, Robert, with a bedewe, a type of knife apparently, 'up to the hilt'. Finally, Roger, the chamberlain, 'spitted' him in the belly above his naval. After his murder his body, now headless, was cut into quarters and dumped at his manor of Edgecote. The conspirators were apparently hoping to disguise where the murder had taken place. When all the players were rounded up, Juliana was found to be pregnant, Sir John claimed he was a 'clerk', and fell under the jurisdiction of the Church, but it was proved that he and Lady Juliana had married three days after the murder so he could not make such a claim. A whole host of characters took part in the murder, but only Lady Juliana was executed for the crime. Sir John de Vaus was found innocent by a jury of his peers, fancy that. So far, life has remained fairly much the same for the family or at least for the heir to the estate. The heir to Grazebrooke Hall most likely had peasants working his land. They may have been freemen, but more than likely they were serfs, tied to the land. The population of England has been steadily rising and is estimated to have been between 5-7 million. Some time after the year 1348 William, son of Robert, inherited his father's claim to the estate. 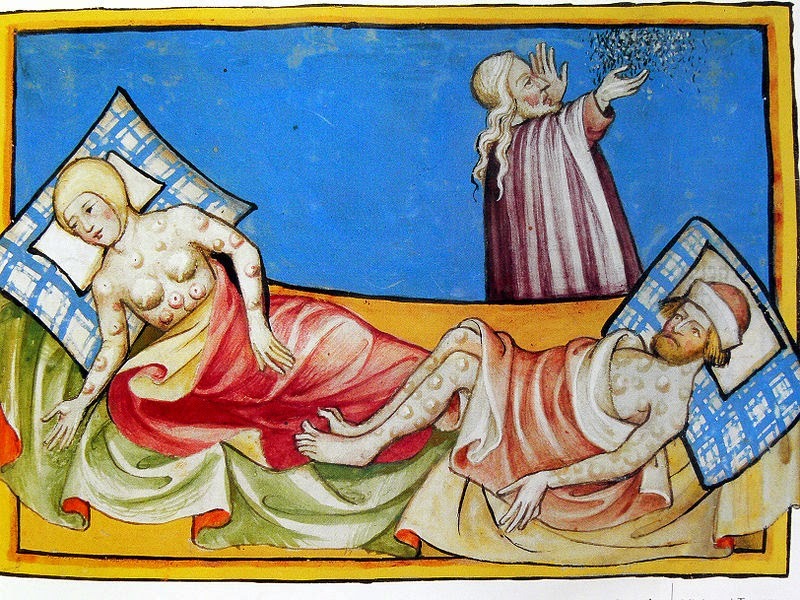 1348 was a very bad year, it was the year that the bubonic plague arrived in England. Bubonic plague, aka the Black Death, decimated the population of England. As much as fifty percent of the population perished. Obviously, our Grazebrooke family survived, but their lives were altered forever. 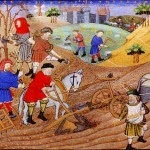 One major result of the plague was the breakdown of the feudal system. During William's tenure at the family helm other changes were happening. The de Grendon family lost Shenston Manor, it was now held by the Henry, the powerful Duke of Lancaster. In 1348 William purchased a parcel of land called Swetewallemor in Shenston. One thing that didn't change was the constant legal battles both fought and defended. William was dead by 1383 and was succeeded by his son John. This John was pretty much unremarkable and was succeeded by his son John by 1410. The only thing of remark about this John is that we know he had a sister named Alice. This is the first de Grazebrooke female named in any record so far. 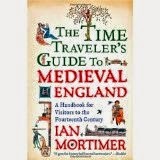 Another really great book to read about life in Medieval England is the Time Travellers Guide to Medieval England. I have read it several times, and go back to it of information when I am doing research. So, now we are down to the ninth generation or so. William's great grandson John holds not only Grazebrooke Hall, but also now holds the manor of Shenston. His name began appearing in the records in 1473, King Edward IV was on the throne. His coronation in 1461 brought an end to the War of the Roses. After his death in 1483, his brother Richard would rule for a few years until he was killed at the battle of Bosworth Field by Henry Tudor and his forces. 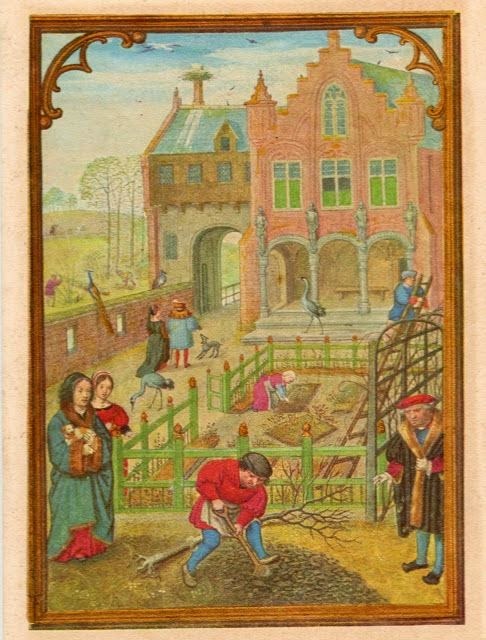 In a 1506 court case John Gresbroke the Younger sued John Gresbroke the Elder for keeping him from his rightful lands which included 2 messuages (land with a house on it), 2 gardens, 100 acres of land, 20 acres of meadow, 100 acres of pasture, 20 acres of wood, and 5s of rent in Shenston, Stonhal, Fouderley, Lynde and Chesterfield. The family had obviously accrued quite a large amount of land. At this point the genealogy gets a bit tricky. It seems that John the Elder had two sons both named John. They were John the Younger and his brother John of Middleton. John the Younger was the heir but his brother John was given land in Middleton and a home called Stoke Hall. part two will take up where this leaves off.